The dogBar® was created by European product designer Jirri M.R. Katter using intelligent design and handcrafted in Germany. This beautiful raised dog feeder is handmade in wood collected from FSC licensed and sustainable forests in Germany and made using specialist techniques. The dogBar® is sturdy, strong and suitable for all dog breed types with removable dog bowls in high grade stainless steel with a 3 ltr capacity which are fully dishwasher proof. The sturdy structure has recycled rubber pads on the edges to prevent slippage and the surface is cleaned by using a warm soft cloth in soapy water. Why purchase a raised dog feeder? By raising the level of your dog bowl hight this assists your dog in digesting their food, rather than letting them bend double to eat at ground level. By raising the height you will notice that their spines remain level which can help to reduce twisted gut syndrome. Another major plus is not only does this fabulous raised feeder look amazing in your home, you will find that the floor area around and underneath the dogBar® remains clean. No more water and food spills nor scattered dog bowls to fall over in the dark. There are 2 alternative Sizes available - do please select dogbar® S or dogBar® M for details and pricing. And if you would like to purchase extra Stainless Steel bowls are available separately priced @ £13.00 each. Notables: made from real wood, discolouration of the surface may occur if left in strong sunlight and if the surface is damaged and water ingress occurs the wood may warp. Keep on a level straight surface and wipe clean with a soft warm wet cloth do not use strong detergents and remove the stainless steel bowls to clean in hot water or place in the dishwasher. 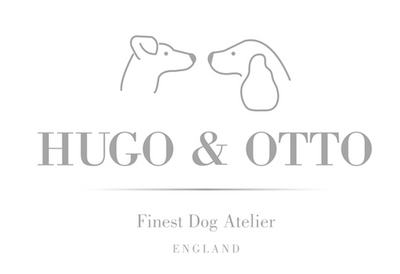 Shipping is set for the UK & Europe please email us on sales@hugoandotto.com for Worldwide shipping.